I own the 17 HMR version of this rifle, this little rifle is awesome for its size and very accurate. 22 rim fire more plentiful than17 HMR. Although the 17 is quite a cartridge for its small size. Very accurate rifle. Sub MOA out of the box with average ammunition. CCI patterns great. 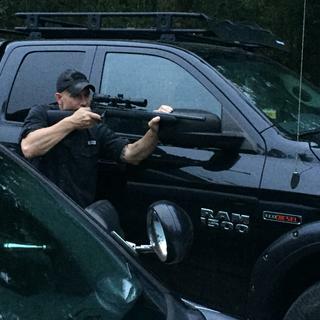 Using Vortex Rimfire 2-7x scope. Threaded Barrel is a plus. No brainer purchase. Savage offers a lot of rifle for the money here. What thread pitch is the barrel? Features threaded barrel (1/2-28) & is suppressor-readyEnter an answer to this question. BEST ANSWER: Yes I believe that there is a screw to adjust the trigger, poundage up or down. Check the Savage website. Also you can watch the videos on yputube. Mine came with the Savage Accu-Trigger. Not externally adjustable, but fairly easy to do with supplied tool after you remove the stock. Yes. Mine was set at 2.75 pounds from the factory and I saw no need to change it. Yes, this model does have an adjustable trigger. Yes, it has the accu trigger. Got this as a suppressor host and did not disappoint. Very quiet and extremely value priced for the accuracy for get out of it. The stock is cheap feeling but right on with the price point. I swapped mine out for a Boyds stock. The magazines are not the best quality but again the rifle is cheap so buying an extra mag shouldn’t put you out of your home. Overall a great 22 for its price range. This gun is a tack driver and the most fun you can have! With subsonic ammo you can easily shoot it without ear protection, no need for a can on it. I only gave it four stars because of the magazines. They are not interchangeable with Rugers 10/22, relatively expensive, and I can't find any with more than 10 round capacity. Other than that small issue, this gun is a winner! really accurate .22 love it , shoots better than i can shoot. 1/2 inch at 50 meters, accurate even with cheap ammo. Love this little gun. Worth getting a 10 round magazine and possibly replacing the stock. Track driver right out of the box you can't miss. Add a suppressor and it's the perfect little hunting rifle. This rifle out of the box has a great trigger, placed a vortex Crossfire BDC scope on and this thing is a tack driver. Only came with one 5 round magazine, is the only issue I found with the rifle. Good, but better with a Boyd's stock. The trigger is very crisp and clean. The action works good and it is very accurate. 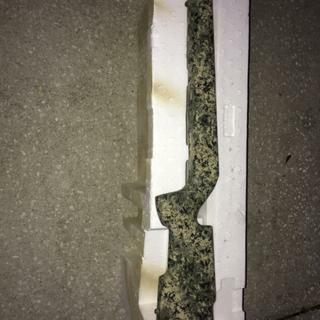 The stock is very flimsy so I bought a Boyd's laminate stock, which improved the accuracy. Pair this with a good suppressor and you have yourself a very good silent killer. This little platform is light , quick and razor accurate. I mounted a BSA Sweet 22 scope and zeroed at 50 yards. Deadly head shots on whistle pigs and squirrels. Great little rig - money well spent. 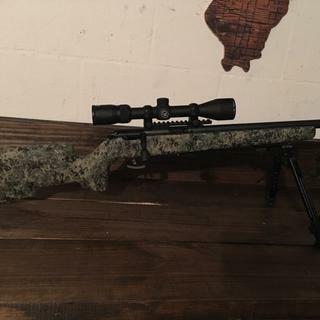 I recently purchased a leupold freedom rimfire 3-9x40 for this gun. It is a tack driver at 50 yards. Ive only shot about 50 rounds through it. I will definitely be buying a boyds stock for it. The factory stock is garbage. Other than that this gun is amazing. It cycles smoothly and will be receiving a suppressor in about 12 months LOL. Sweet little gun supressed. Shooting 1/2" groups at 50yards w/Spectre 22 and CCI subs. Excellent firearm and a definite must have for "precision plinking" -- Just be ready to buy a stock immediately. Excellent firearm. Drives tacks at 100 yards with the high velocity ammo I've been using. Getting about 1moa from the gun with decent stuff. Better with high quality - less with low quality. Only 2 downsides I have are: #1 - you must run a scope or mounted sight, since there is irons on the gun (rear or front). #2 - The stock is designed for a gun with irons, not a mounted optic/sight. Therefore the stock is way too small and short once you have a little scope (or your optic of choice) mounted. Be prepared to purchase an aftermarket stock - which runs around $100-150. The bolt had a nice tight fit from the factory that has worn itself in nicely after about 500 shots. No play and very smooth. Even with the 2 downsides, I'm very happy I got the gun. Wow. What a tack driver. This thing with subsonic ammo and just a 4 power Barska 50 dollar scope is putting 100 yard groups in a quarter. 50 yard groups are in a dime. Great little gun and fantastic service from GAG. Once again Grab-A-Gun had the best price I could find. The Savage Mark II FV-SR is a fantastic 22lr rifle. Waiting on my Boyd's Tacticool stock to make it perfect. Grab-A-Gun is slow to ship items but they let you know about that on the item's web page. 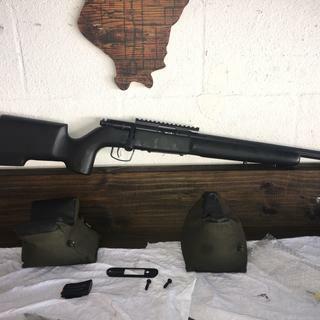 I purchased on 9/19 and it was delivered to my FFL on 9/30. Not so bad as long as you are expecting it. Thanks. best thread barrel in 22lr. my freind has one with a yhm suppressor,and i want one bad..it so accurate is insane..keeping my eyes on this one for when it comes back in stock,,i'm grabing one. Bolt action repeater with black synthetic stock with checkering, detachable box magazine, AccuTrigger, and rail. Threaded carbon steel 16.5 inch barrel with 1/2-28 threads and matte black finish. One in sixteen inch rate of twist. Five round capacity.